Ranging in size from less than 1 inch long to more than 45 feet from tip to tip, squids are adaptable creatures and opportunistic feeders. Whether they cling to sea grass in shallow bays and inlets or patrol the ocean's darkest depths, squids are intelligent, stealthy hunters that feed on other ocean dwellers. Squids most commonly eat fish, crustaceans and other squids. Even the world's smallest squid is a predator, the southern pygmy squid (Idiosepius notoides). The females of this species grow to about 1 inch long, and males are about 3/4 inch. On the opposite end of the size spectrum is the giant squid (Architeuthis dux), the largest invertebrate in the world. Females grow as long as 45 feet and males about 33 feet. Claims of squids as long as 60 feet long have not been substantiated. Scientists know for sure that giant squids feed on other squids and large fish that swim alongside them in the ocean's depths. Information about the giant squid diet comes from the stomach contents of the only two intact specimens researchers have found to date. Squids use their tentacles to catch other animals. The tentacular clubs at the end of their tentacles are covered with sharp suckers that latch onto prey. Once a squid has nabbed its quarry, it holds the animal captive with these clubs and its suction-cup-lined arms. With its hapless victim immobilized, the squid draws the animal toward the pinnacle of its limbs, where its mouth is. A squid's mouth resembles a parrot's beak -- sharp, curved, chitinous, and pointed -- which it uses to nip off chunks of the prey sized for swallowing. Inside the squid's mouth is a radula, a tonguelike organ covered in rows of tiny grinding teeth, that helps the squid further break down its food. The squid needs to take its meals in pieces because the esophagus actually passes through the squid's brain within the head. Some squids, like the Humboldt squid (Dosidicus gigas), are nocturnal hunters. 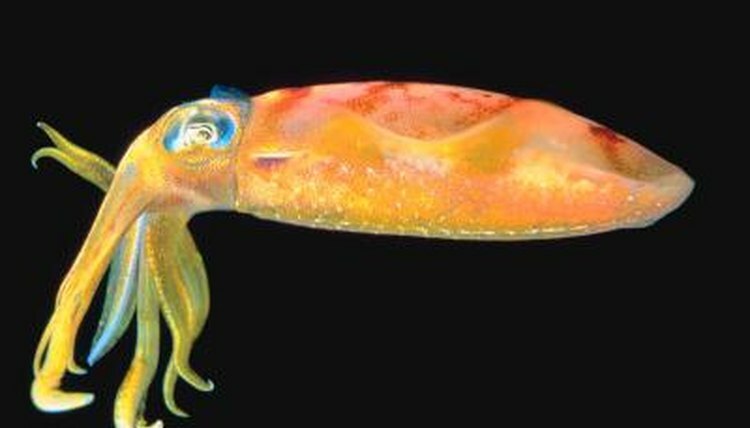 Humboldt squids communicate with each other while they hunt, using their chromatophores to flash light and change color. In a feeding frenzy, squids can wrap their arms backward around their heads to approach their prey mouth-first. Other squid take a more clinical approach to killing. The pygmy squid sticks itself to a blade of sea grass until a tasty-looking shrimp swims by. In an instant, the squid snaps out its tentacles, seizing the shrimp and breaking its nerve cord, immobilizing the animal so dinner can be served. The size of a football with red skin, huge blue eyes and webbed arms, the vampire squid (Vampyroteuthis infernalis) is a menacing-looking creature. Researchers couldn't figure out what it ate for years. Observation of live specimens determined that, despite its threatening appearance, the vampire squid is a docile creature, dwelling in the darkest depths of the ocean and feeding on tiny aquatic debris. The vampire squid is a detritivore that uses its sticky, super-thin tentacles to gather particles called ocean snow: detritus, slime, and remnants of dead animals that sink down from shallower layers of the sea. The squid eats the debris off its tentacles shish-kebab-style.